The Little Big Company in partnership with The Inspired Occasion is event managing and styling a party and graduation ceremony for Ronald McDonald House guests in Melbourne at the Parkville House. 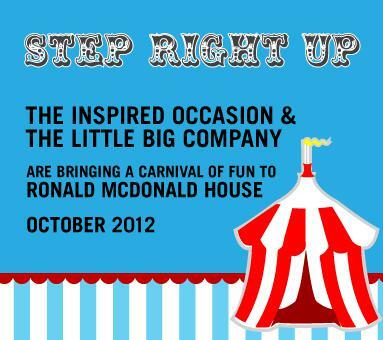 On October 20, we will be joining forces and hosting a carnival themed celebration for families that have relied on the support of Ronald McDonald House and Ronald McDonald Learning Program. Ronald McDonald House is an affordable home-away-from-home for the families of seriously ill children being treated at the Royal Children’s Hospital. Rather than spend the night in a hospital waiting room, family members can stay in comfort at Ronald McDonald House where they also receive support from staff, volunteers or other families who are sharing similar experiences. Facilities include private family rooms, shared bathroom, kitchen and lounge facilities, quiet rooms and play areas. Established in 1986, Ronald McDonald House at Parkville accommodates 47 families each night of the year. Since opening its doors the House has provided a ‘home away from home’ for approximately 36,000 nightly guests each year. As hospital stays, treatments and surgeries increase annually, so does the demand for this much needed service. The House is an ideal place for families to be together, offering the comforts of home during one of the most critical times in their lives. Located close to the Royal Children’s Hospital, which admits Australia's most complex pediatric patients, parents know they are not far from their child’s bedside when not with them on the ward. The location also allows sick children to reside at the House with their parents and siblings if they are well enough, and go to the hospital for daily treatment. The House is a vital support service for so many families in need, offering warmth and inspiration and allowing friendships to be formed as families share a similarly challenging journey. The House is a place where everyone understands the importance of small ‘wins’ and the celebrations that come with these along with the empathy and outpouring of love when facing immense sadness in their lives. The Ronald McDonald Learning Program (RMLP) provides tailored education programs to help students recovering from serious illnesses, such as cancer and cystic fibrosis, to catch up on their missed education. The RMLP offers a comprehensive, multidisciplinary approach to overcoming the learning difficulties brought about due to illness and school absence. Outside their program there is little assistance for the educational needs of seriously ill children. There are no additional support systems, groups or organisations that offer one-to-one teaching for these children with a qualified teacher. Medical and educational professionals are extremely supportive of the program as they acknowledge the gap in current services for these children. The RMLP is an Australian initiative with international recognition. The program is holistic and looks at all aspects of the students’ learning, providing services such as psychometric assessment, speech and occupational therapy along with weekly tuition from a highly qualified teacher. It currently supports 800 students across Australia from Kindergarten to Year 12. The aim of this event is to put a smile on the families’ faces and as event mangers and stylists we feel the best way to help this wonderful organisation is to provide a fabulous party for those families affected by sickness or injury. We will be developing a “Communities” page on our website which will be devoted to regular updates on the event, as well as other charities we are supporting andover the coming months we will tell the stories of all of our contributing companies, with more to join us in the near future. Please contact [email protected] if you or your company would like to contribute to this magical event. With more and more small businesses contributing by the day we will be sure to update this blog very soon with more wonderful business contributions.